More than 70 participants attended the recent ‘PDiaverum’ symposium Potsdam, the aim of which was to find ways to increase PD usage. 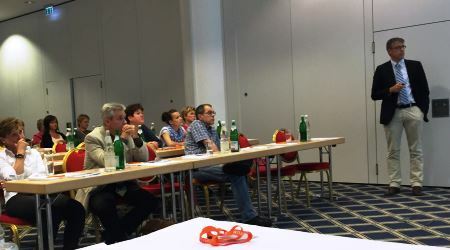 The PDiaverum symposium was organised and led by Dr Thiemo Pfab, Medical Director at Diaverum’s Potsdam centres and expert in peritoneal dialysis (PD). The attendees included many external nephrologists and PD nurses. Local, national and international speakers addressed the question on how to overcome obstacles on our way to increase PD usage with the aim of giving more autonomy to our patients. Dr Pfab explains that despite some efforts, PD usage still remains on a low level of about 5 per cent in Germany. “Although in our Potsdam Clinics we are clearly above 10 per cent and growing, there is still a considerable potential in offering PD to our new end-stage renal disease (ESRD) patients, and even to some of our prevalent haemodialysis (HD) patients,” says Dr Pfab. A large part of the event was dedicated to the topics of ‘assisted’ PD in an era of an ageing population and also to new developments in APD, PD trouble-shooting and case vignettes. The talks delivered by Diaverum doctors and PD nurses offered external stakeholders an insight into Diaverum’s efforts to push PD by means of structured pre-dialysis care and continuous staff education. Dr Belén Marrón, Diaverum’s Global Medical Director Home Therapies, pointed out the experiences and achievements of the d.ACADEMY’s Patient Education programme. The Diaverum initiative was appreciated and led to questions by external nephrologists even days after the symposium. And it was a chance for best practice sharing for all participants.